BROWNIES' LOVERS PLS TAKE NOTE !!! 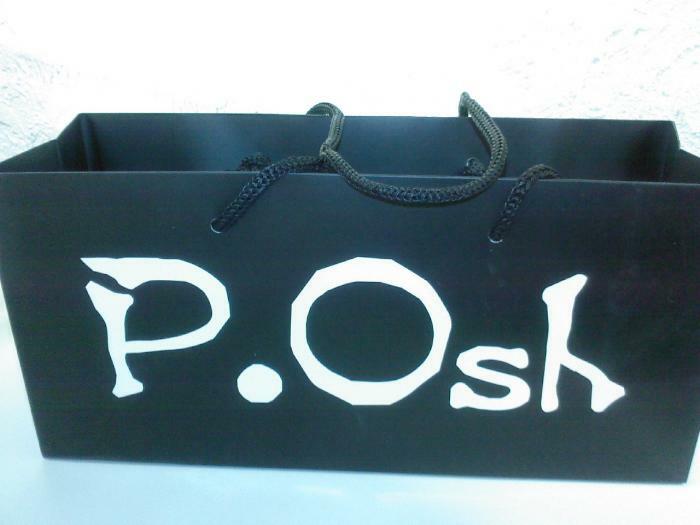 P.Osh is the shop which sell brownies and it would make you attract to it whenever you have finish the one on hand ! 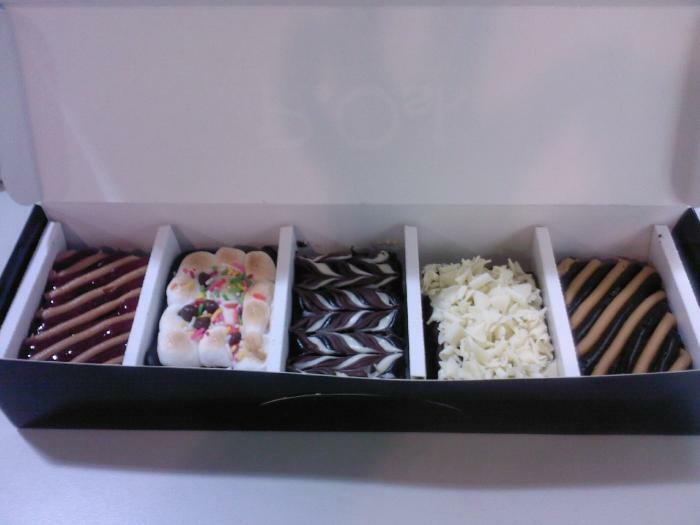 I was amazed by the decorations P.Osh staffs had made as it was my first try of P.Osh brownies. When the brownies was place into my mouth, the chocolate just melted straight down my throat. I was amazed by the awesome brownies made by the staffs. Not just the brownies are simply awesome, the little decorations on the brownies even make it more fantastic. Competition is very tough in the Food & Beverage industry. Comparison is thus inevitable among the different competitors. In the cut-throat environment, we have to give credits to entrepreneurs who dare to be different, who dare to venture out, experiment with different food and put their creativity to use. And this can only be good news to consumers like you and me, with competition will there then be improvements and innovations, and this can only mean there will be more variety and choices for us to choose from. Applause to the food entrepreneurs who make all these happen, and to do that, we need to support them by trying their food. P.Osh is the brainchild between the two owners, Paul and Josh who both have a passion for brownies and cookies. Well they find most of the brownies to be fairly similar, and boring. Then through experimental, they came up with their own version of how a good brownie should be like, and hence the born of P.Osh. P.Osh is located at the shopping belt of Dhoby Ghaut Mrt, where it is ideal in serving the shopping and the working crowd. 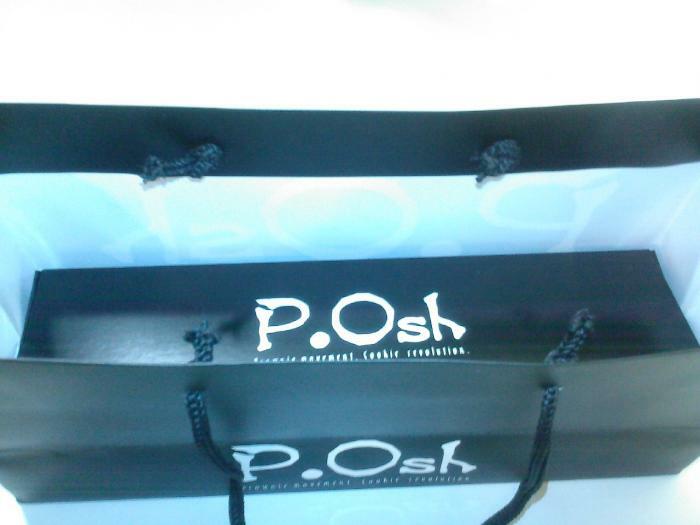 It is the name P.Osh which stands out though. Remembering i seen the name before, i follow the trait to the little outlet and this leads to the brownie discovery! The owners explained that there are currently about 11 types of brownies available, and you can get 5 in a box for $13, and 10 mini ones for $20. Like i said, comparison is inevitable in this line, and having tried brownies from the Brownie Factory recently, it’s no surprise really that i’ll compare both to give a big picture. 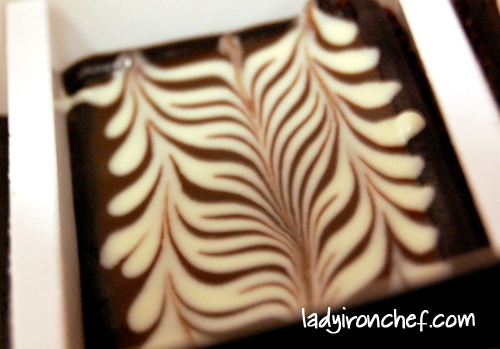 The Triple Earle C. like the name implies, is make up of three different type of chocolates, namely dark, milk and white chocolate. However, it is not as sweet as the the name suggests, compare with the other few, i certainly don’t find the triple chocolate sweet, i guess the dark chocolate helps to balance the sweetness, which is quite similar to the triple choc which i had at Brownie Factory. Mint E. Choc ($3.30) Mint mousse and dark chocolate constitutes the Mint E. Choc brownie. I like the refreshing mint mousse which coupled with the dark chocolate makes a good balance between the mint and chocolate taste. The Mint E. Choc brownie is the newest creation of P.Osh, so if you brought their brownie before, it is likely you haven’t seen this one unless you been there recently. The coffee caramel brownie or Coff E. Choc is also one of the favourites at P.Osh. The strong hint of caramel is evident, but there isn’t much coffee taste. I guess it’s good news to non-coffee lovers like me, but a disaster if you would want the best of both worlds, your coffee and caramel. Now, the Marsh E. Mellow is what we are looking for, this without a doubt, is my favourite brownie among the 5. The marsh mellow is slightly toasted to bring out the sweet flavor. And the staff actually designed this brownie on the spot, so you need to wait a while as they helped to make it pretty. This is actually the same as the Triple Earle C just that Wal Nutt B is triple chocolate on walnut. I preferred the triple earle c maybe because i don’t really fancy walnut. But i have to admit the walnut does help to reduce the sweetness level, that is if you don’t want your brownie to be that sweet. Total bill for a box of 5 brownie is $13 with choice from 11 brownie selections. The brownies at P.Osh is creative and pretty to look at, but i have to point out one fact, the base of all the brownie here are actually the same, with the difference mainly in the toppings. Whereas for Brownie Factory, the brownies there have brownie bases which differs in taste and looks with some being more chewy, some being softer and harder. But for the brownies at P.Osh, all of the brownie bases are the same, and i become a little sick after i try all the brownies, because all of the bases taste the same except for the exceptions of the toppings above. The owners explained that their competitors actually add different fillings into the base, but for P.Osh they decided not to because they felt that by using toppings they will be able to match tastes which would not go well if infused. And infused tastes would go almost as well if done as a topping. And most importantly, the looks of the brownies are much better in terms of colour and design. I do agree appearance wise, the brownies at P.Osh certainly are up a notch with their bright and vibrant colours as toppings. But i guess its really up to the individual, personally i’ll prefer to have more variety in the base, but if you are all right with it, the pretty brownies here certainly makes a good box of gift. I’ll like to once again applause all the food entrepreneurs out there, for you all make our world of food more interesting. 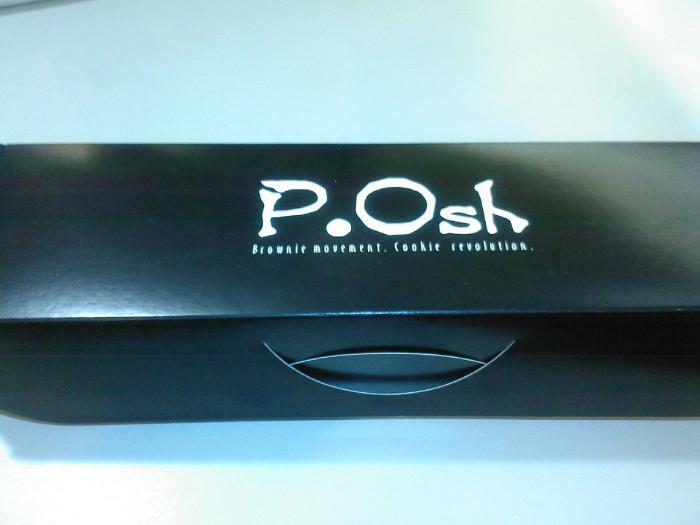 And to the folks at P.Osh, continue your brownie revolution! Buy flowers as gift? That is so passe. A box of chocolate as present? That is so last season. Buy a box of brownies, from P.Osh! I want to try!! Must find time to go try this one day. My friends and I simply loved to try out food and desserts. For me, desserts stands for most of it. So when I saw this link for ePosh, I just click on it out of curiosity. My first impression, the website is difficult to navigate in with its black background and brightly colored words and the extremely small words. Nevertheless, what is a website if it serves good desserts. So we went especially from the West to Dhoby Ghaut just to get a taste of the desserts. To our dismay, the shop is just a shop front. There were no seats but just a counter sort of like Famous Amos or bubble tea. There were not much cookies left, just maybe one or two cakes at the counter and of course, brownies. The serve crew (polite and good service quality) at the counter gave us some brownie base to try. To me, its too sweet though the texture sure is better than a lot of other brownies I've eaten. Chewy and not dry. They currently have 10 flavors out of which, we bought Jelly Peanut butter, White Choc, Triple Choc, Mashmellows, Choc butter. They also have chilli choc which I found rather special but I didn't try as I don't eat chilli. On first taste, their brownies are definitely unique and tasted above average. But as we try on, we felt thats all there is. There is no "oopmh" of tasting a great dessert and as all the brownie bases are the same, the only difference is its blend with the toppings. If you really want me to say, I'll recommend white choc and Mashmellow (toasted). But frankly, it would be better if there are seats in the shops for patrons to sit in, not just 2 chairs in front of the shop. Desserts especially brownies, cakes and cookies taste best eaten fresh no matter whether they can be left outside for 3 days without refrigeration. Price is still ok, going at $3 per piece of brownie. Currently they have a promotion of 5 pieces at $13. Great as a gift as it comes in the beautiful and posh box and paper bag in the pictures. I like the packaging! For that, I'll go try the brownies one day! haha! Thanks for the review! I love the packaging too! Maybe can buy home ba. This one is located within the mrt station itself? Is it at dhobyghaut Xchange?